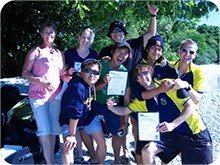 We have 2 different options for your Instructor course in Khao Lak, the “Instructor Internship program” where you prepare and work to pay for your course or the “Standard Course” where you jump in directly into the IDC (stands for Instructor Development Course which prepares you to the Instructor Examination aka IE). The PADI IDC in Khao Lak is your chance to take the best decision of your life and become a PADI Instructor. You will be able to teach you passion around the world, travel and make a living. After you completed your Divemaster course, now you can sign up for the Instructor Development Course (IDC PADI), which will provide you with valuable hands-on training with the emphasis on fun and in-water application. The cutting edge knowledge gained will expand your Career Opportunities. After the IDC you will pass the IE which is the Instructor Examination by PADI Examiners. After succeeded at the IE you will be certified PADI Open Water Scuba Instructor (OWSI) and will be able to start working and make a living from your passion. 2 Options available, “Normal Course” or “Internship” work as a DM to pay for your course and gain experience! If you are planning of being a instructor and work in the diving world, yes you need to have a complete set of gear. You get 15% discount on our retail equipment. Dive gear are as well available for rent. What can I teach after the course? You can teach Discover Scuba, Open Water, Advanced, Rescue, Divemaster. Where can I work after the course? Am I guaranty to succeed? No, you need to meet the skills and knowledge to pass the exam and succeed. 90% succeed you will just need to study and practice seriously. Not Included: Teaching Materials, PADI certification, dive equipment, accommodation, food.